The Rubway Multisport poured-and-paved cycleway technology with multifunctional sport surface can be the 21. century alternative to tarmac or concrete. 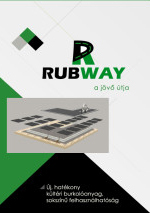 The monolithic wearing course is utilizing recycled rubber tire chips and urethtan based bonding agent, therefore – among other benefits – the Rubway Multisport is more flexible than tarmac or concrete and does not crack or break like traditional hardscape surfaces. Rubway Multisport is recommended for cycleways, sideways, walking paths, recreational tracks or wheelchair accessible forest trails. The surface of Rubway Multisport can be used by bikers, runners, pedestrians, rollerskaters horse riders, also perfect for strollers, wheelchairs. Rubway Multisport Flow – The natural way of drainage. The pervious system of the Flow allows the stormwater to efficiently return into the ground while controlling erosion. The porous wear layer allows water penetration through the pervious base layer, – which also contains stone – directly to the ground layer, adapting the proven way of nature for handling rising drainage issues. 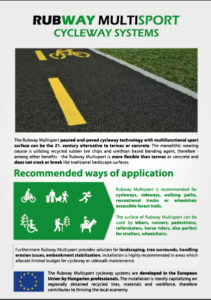 For more information about Rubway Multisport Flow, please check this site or download the product intro leaflet in pdf. Rubway Multisport Shield. – The traditional way of drainage. Like in case of asphalt the water is directed from the surface of the wear layer to the drainage system. For more information about Rubway Multisport Shield please check this site or download the product intro leaflet in pdf. In order to re-utilize abandoned railway tracks for the community as cycleways we developed a simple construction technique, which also uses Rubway wear layer. Covering the tracks helps preserving their status, on top of this the modular design enables easy disassembly in case of restarting rail traffic.For more information about Rubway Monolit please download the product intro leaflet in pdf.